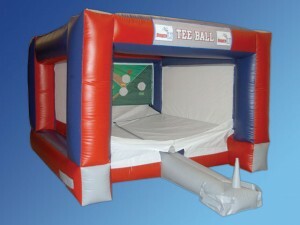 Introducing Shaughnessy Rental’s newest bounce carnival game – Tee-Ball! Watch the ball mysteriously float on top of the tee before you swing the bat for a hit! Hit the ball through a base-hit target! Challenge your friends to hit it through the home-run target! Use the targets to play a mock 9-inning baseball game! The fun never ends with the Tee-Ball bounce carnival game.